Remember that wirelessly powered E-ink tag system I showed you back in June? 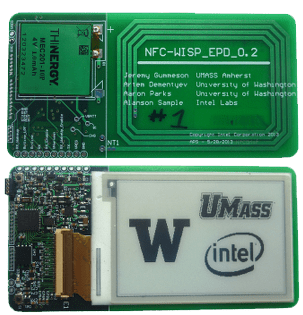 A team of researchers at the University of Washington, the University of Massachusetts Amherst, and Intel Labs have come up with a very similar trick involving an NFC equipped smartphone and a 2.7" E-ink screen. They're calling it the NFC-WISP E-ink Display Tag, but when you strip away the cool tech it's largely the same idea that Mpico showed me in Vancouver and that British Airways is using for their new luggage tags. This concept probably won't be practical with large E-ink screens or high resolution screens, unfortunately. 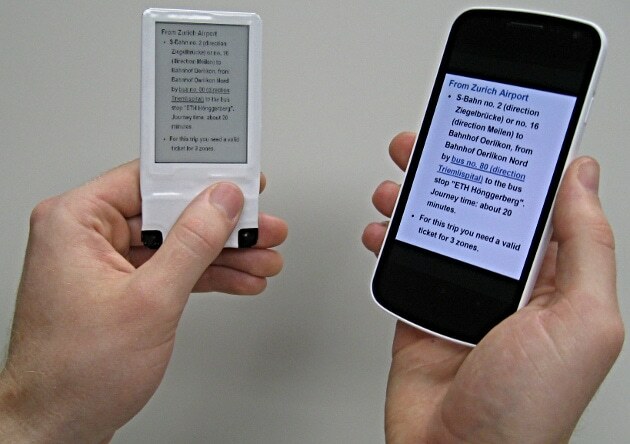 E-ink screens require a fair amount of power each time you refresh the screen, and of course larger screens require more power. That means the time required to transmit enough power increases with the screen size, and I doubt anyone wants to wait a really long time while holding their smartphone to the E-ink screen.. But this concept will let you do things like transfer a low resolution version of a screenshot to the small E-ink screen on the WISP Display Tag. You can't do anything with it other than look at the screen, but that's still pretty useful, IMO. Now, this demo might not be the first, but it does have at least one point in its favor. The researchers want to release the design as open source. If that happens then it would mean that pretty much any hardware developer could use the design to produce their own hardware, thus speeding more competing products to market (and into my hands). Actually, there is a way to power larger screens via RFID; a small onboard battery (or capacitor) trickle-charged via RFID (or ambient) RF. You could also build a system for in-library or in-school use powered by a dedicated emitter, making the devices useless off-site. No real cost savings unless you build something that runs off a ambient RF and even that is doubtful. Yes but that’s not actually battery-less system. You might as well just slap an RFID antenna on a regular ereader. Could be useful for signage: just clip them into place and remotely update and power them. The value depends on how cheap they can makes the tags. I don’t understand why they need electronics in the E-ink labels at all. It should be enough to have the E-ink foil alone as the label (the common electrode is not on the front as usual but on the backside). And then you have a “writing device” that has a TFT backplane on its back. Just hold the writer flat on the label so that the backplane completes the E-ink display, press a button et voilà, you have a new image on the label. The only electrical contact needed is one pad for the common electrode. You would have to line up the backplane and the sheet perfectly, which is not always easy. I think a slightly better option would be to feed the E-ink sheet through a printer type of setup and print one line at a time. It might be slower but printers are also a well established tech that could be adapted readily. The b&w E-ink displays need no alignment, only the color ones (Triton) do. Using a printer type devices is IMHO silly – just use paper then. Think, for example, about the long shelves in stores with the price tags at the front. Changing the labels is error prone and slow. If you instead glue one long strip of E-ink foil along the edge of the shelf where the price tags are usually placed, you can simply change the label by holding the writer over it. Add a barcode scanner to the writer (to scan the product before placing the label) and you get a nifty low-cost labeling system. I want to do banners, and a feeder system would work better.